Ecalpemos: A trumpet player in Edinburgh, Scotland. A trumpet player in Edinburgh, Scotland. My name is Gordon Hudson and I am a trumpet player living in Edinburgh, Scotland. I occasionally blog on trumpet and cornet related issues. You can find other articles by me tagged "trumpet" here, or cornet here. In the late 80's and early 90's I did quite a lot of freelance/semi pro playing but these days I spend my time working for a charity and playing the trumpet and cornet on an amateur basis. Before moving to Edinburgh I played the trumpet with the Open Orchestra for seven years until 2010. After moving to Edinburgh I spent a year playing principal cornet with Penicuik Silver Band and then solo cornet with Kingdom Brass B until it's demise. I then played repiano cornet with the Bathgate Band in first section. Although I am currently not a member of a brass band I practice daily, play a bit of traditional jazz, and do occasional orchestra concerts and big band gigs. Until something more permanent comes along I am doing a bit of home recording which I call "The Sofa Sessions". Its an occasional thing and you can find the videos on my Youtube Channel. My experience of Edinburgh is that there are not a lot of playing opportunities here. The same people seem to do all the gigs and there is a general preference by amateur groups for people who have been to music college. As a result, since moving to Edinburgh, most of my playing has been outside Edinburgh and mainly in the brass band world. I started playing at the age of 10 (french horn) switched to euphonium at 14 (because I really wanted to play in a brass band) and then trumpet and cornet at around the age of 19 (although I still doubled on euphonium for a couple of years). My brass band experience includes Stirling Public Band, Alloa Band (1st and 2nd section) and Alva Band (championship section), Livingston Brass Band, Newlands Concert Brass, principal cornet with Penicuik and solo cornet with Kingdom Brass B. I have played Bb cornet and Eb soprano cornet. As an orchestral player I have performed a wide range of repertoire from baroque to modern works including concertos and other solos. This includes a lot of piccolo trumpet playing in baroque music. In addition to playing trumpet, cornet and piccolo trumpet I play french horn to a level good enough for second or third horn. Favourite players: Maurice Andre, Phillip McCann, Ludwig Güttler, Chet Baker, Jack Mackintosh, Bix Beiderbecke and, of course, Louis Armstrong. I used to play on Monette equipment, but switched to this a couple of years ago. It has a larger bell than the standard 37 Bach trumpet that most players use but it is still a medium large bore. It was bought as a compromise for big band or orchestral playing. I find it works well in all situations. 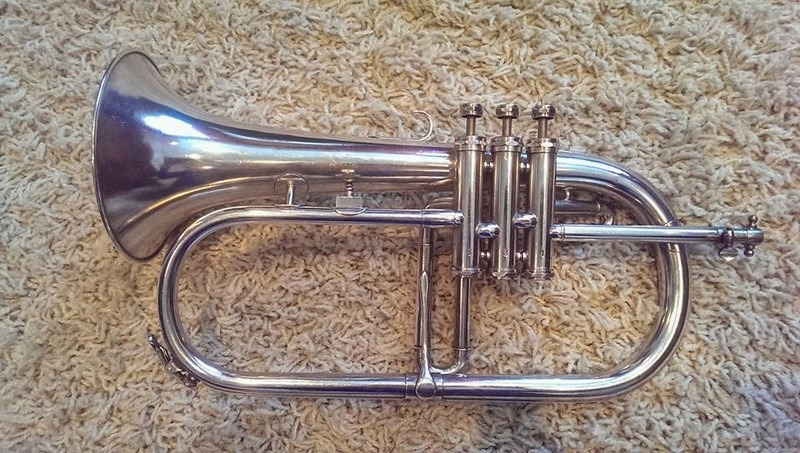 This is currently my main orchestral trumpet. I have two tuning slides - one with the single water key and one with two uberblasenklappen, or Vienna keys for C and A. The Scherzer 8218W is based on the Monke design which is why they call it their "Kölner Modell". The bore is 11.5mm (slightly larger than most rotary trumpets). The bell is made of gold brass. The same model played by Louis Armstrong. Mine was made in 1952. .450" bore. Quite small by today's standards, but has a surprising depth to the sound. More on this instrument here. I have tended to play mouthpieces around the 3C/1.5C diameter. Because I play on instruments with different fittings and different requirements I have an abnormally large number of mouthpieces. I do 90% of my playing on a Horntrader HT-3-27 and a Flip Oakes Extreme X3X. In the past I have used a Jet-Tone MF-P for big band which is a pretty rare mouthpiece with a #22 throat. I am not really doing that kind of playing any more so it rarely comes out of its case. 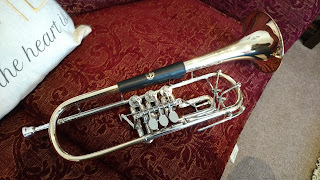 This is a four valve rotary trumpet made in China but modified with a Blackburn leadpipe for A. Although it looks like a Scherzer the bell is bigger. It seems to be a copy of the "Melton" rotary trumpet which was made by Scherzer in the 1980's. 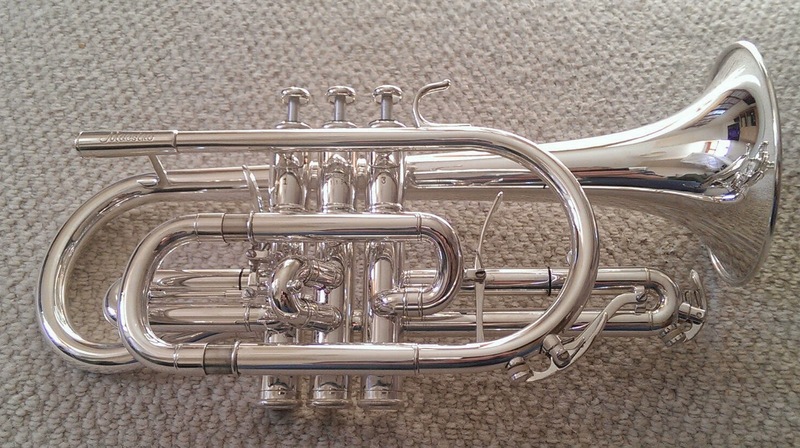 It plays very well in A and is the best piccolo trumpet I have ever owned in that key. In Bb it plays OK, but its not quite as good as it is in A.
Mouthpieces: Josef Klier 7DW (similar to a Bach 7DW but with a bigger backbore). Starting to experiment with the Horntrader HT-3CS-28. This instrument is from the early 70's and is of the narrow bore style of flugel. It has the added advantage of using a cornet shank mouthpiece. This is one of the earlier Maestro's without "UK" after the model number and with no engraving on the bell. I bought it second hand and had it overhauled to bring it back into new condition. Mouthpieces: Flip Oakes Extreme X3X. This is a collectors item , made in the late 19th century in Glasgow. You can read the full story of this instrument and my research into the maker here, or view my video review - here. 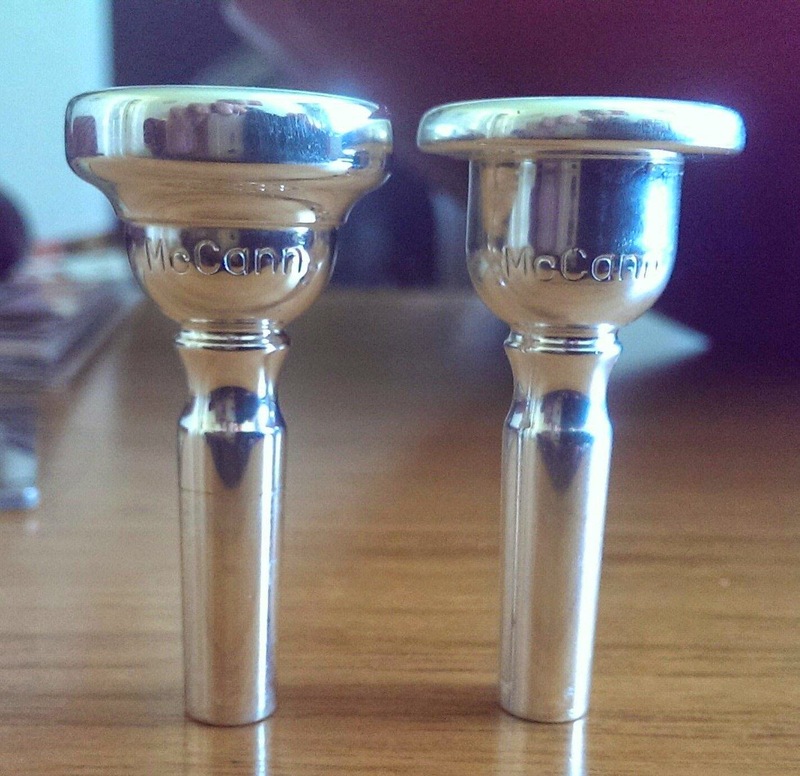 Mouthpieces: Lewington McCann custom; original 1890's narrow mouthpiece. I play on two currently which are around 3C diameter. One is the Breslmair F1 with MV 3C rim. The other is a Lewington McCann mouthpiece which is of similar diameter but with a flatter rim. This has been "skeletonised" with mass removed from around the rim (see comparison photo above). This makes it feel a bit freer blowing and a bit more agile, but it does make the sound a little bit brighter. This gives you some idea of the types of music I have performed in concerts over the years. Most of the standard classical and romantic repertoire. Bach Mass in B Minor and Christmas Oratorio. Vaughan Williams Symphony no 2 (London) (Trumpet and Cornet parts). Played with a 10 piece brass ensemble (using London Brass / PJBE arrangements). Played trumpet with Forth Dimension big band in the late 80's. Occasional recent playing in local bands. Is modern evangelical Christianity "pistic"?